The East Nashville underground/horror/exploitation movie series Cult Fiction Underground recently parted ways with Logue’s Black Raven Emporium and moved into a brand new facility at 1048 East Trinity Lane. If you missed their grand reopening celebration October 11th, worry not. They have lots of great Halloween-themed programs for the rest of October. Highlights include Motel Hell, The Abominable Dr. Phibes, Bride of Frankenstein, Suspiria, and Return of the Living Dead. 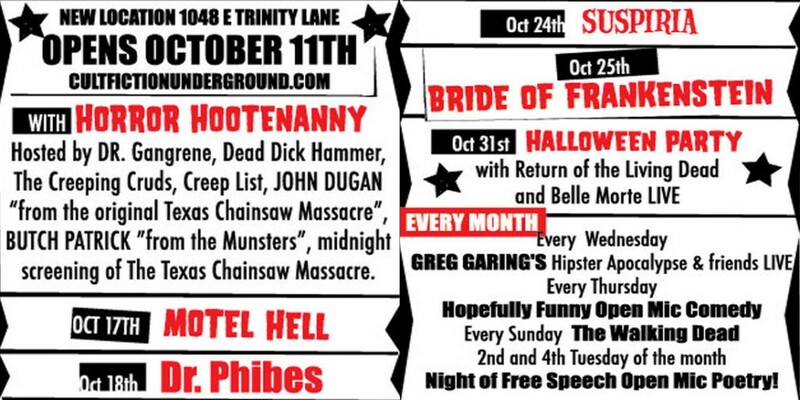 Check the full schedule (including comedy, poetry, and Walking Dead nights) at cultfictionunderground.com.